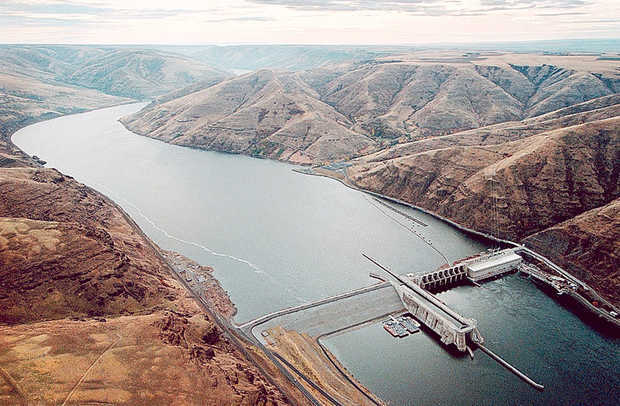 Snake River dams must stand forever (Part 1). Harsh words for our rockstar Congressman but facts are facts and starry eyed Oregonians need to know them. One Mule Team has written about the state of salmon in the Snake River before. What we didn't mention was that though Snake River coho and sockeye are functionally extinct and spring and summer chinook are barely hanging in there Representative Peter DeFazio agrees with Bush when he says "the human being and the fish can coexist peacefully." As legal wrangling over the fate of Snake River salmon drags on and the fish continue to spiral toward extinction, a coalition of conservation groups has been pushing for SEAPA (Salmon Economic Analysis and Planning Act) that would examine the economic impacts of the four lower Snake River dams and determine whether their costs exceeds their benefits. Pretty reasonable. On a related note, nearly 100 Congresspeople recently signed on to a letter urging NOAA fisheries to at least examine the option of dam removal as a way to recover the Snake river salmon as part of the broader Columbia River recovery plan. In my role as Conservation Officer for our local TU Chapter I sent a letter urging Representative DeFazio to support SEAPA. He was kind enough to respond though he does not support the act. I sent him a letter rebutting his reasons for his stated opposition. Not surprisingly he did not respond. Also not surprisingly, he did not sign onto the recent Congressional letter to NOAA. "We must also consider the economic costs associated with various recovery alternatives, as well as the costs of mitigating the economic impacts of those alternatives." Peter DeFazio, in an email dated June 15, 2007. My rebuttal pointed out that the bill is entitled: The Salmon Economic Analysis and Planning Act. Ouch. You ready to blog this on OregonFlyFishingBlog.com? DeFazio and Bush bedfellows: Snake River dams must stand forever (Part 1).